Carbon footprint can be defined as the cumulative effect of various (everyday, business, personal or community) human activities on the environment, or the extent to which we, people, have an impact on the condition of our planet in the course of our private and business lives. A private individual’s carbon footprint can be said to be the total amount of GHGs emitted through their routine daily activities, whereas in the case of businesses it means the total amount of GHGs emitted through their business activities. 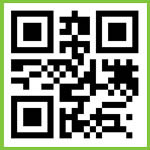 Also, a carbon footprint can be calculated for individual products, services and even for various events. The size or amount of carbon footprint is determined on an annual basis for individuals and businesses, while it is calculated on a case by case basis for products and events. For the last two, calculations are based on the amount of GHGs emitted while manufacturing and shipping a product, or organizing all the activities necessary to stage an event. Greenhouse gases include carbon dioxide (CO2), methane (CH4), nitrous oxide (N2O), sulfur hexafluoride (SF6), hydroflourocarbons (HFCs) and perfluorocarbons (PFCs). When determining the size of one’s carbon footprint, one must examine the amount of GHGs emitted “as a side effect” of the activity or activities in question. Of the ones listed above, carbon dioxide has the biggest impact on our environment, even before methane. Carbon dioxide, or CO2 for short, is a colorless and odorless gas, which is virtually imperceptible to humans and it is partly because of these characteristics that makes it so difficult to fight it. Basically, CO2 is produced by burning fossil fuel, such as natural gas and petroleum, however it is also emitted “indirectly” when using electricity; in the production of electricity the most common method is burning fossil fuel. Approximately 30 billion tonnes of carbon dioxide is emitted into the atmosphere per year on planet Earth. This annual figure is very small compared to the emission resulting from natural phenomena, however, considering that carbon dioxide remains in the air for 100 to 200 years, when these excessive amounts accumulate, they can have a very significant impact on the environment, indeed. Since the amount of CO2 is the most important factor of all the other GHGs listed above from the standpoint of environmental changes or climate change, the size of carbon footprint is expressed as carbon dioxide equivalent (tCO2e), equivalent to one tonne of carbon dioxide. When calculating carbon footprints, for the sake of simplicity and uniformity, the amounts of less important GHGs are determined in tCO2e, thus converting their masses into CO2 mass based on an index of how much they contribute to the greenhouse effect. The tCO2e values, converted from masses of various GHGs, are then simply added up to get total emission figures. Your private carbon footprint can be calculated quite easily based on your daily activities, like home consumption of energy, the number of miles you have driven, the distances you have traveled by air. However, GHG emissions produced during the course of manufacturing food and other commodities you buy must also be taken into account. Your “private carbon footprint” can be reduced to a marked degree by introducing simple lifestyle changes into your daily routine. Calculating your total business carbon footprint is a more complex task than doing your private one. In this scenario, several factors are to be taken into consideration when determining GHG emissions. In order to see the full picture with regard to a company or business activity, it is appropriate to first identify all possible sources of emission and then group them on the basis of whether it is in our power to have any direct influence over them. Based on such an approach, we can make a distinction between so-called “direct” and “indirect” sources. Direct emission sources include those business activities with GHG emissions that your enterprise can control since they are within your sphere of influence. An example would be your gas consumption in the office, another would be that of your production line. Indirect emission sources include those activities with GHG emissions that your enterprise cannot control since they are not in your sphere of influence. An example would be GHG emissions relating to raw materials your company buys and/or uses. Another would be GHG emissions produced when generating the electricity you are using. – or use a combination of the two methods. The latter is recommended in neutralization procedures because the amounts of CO2 added together through your own emission reduction are a huge step forward and deliberate businesses may also find the sources of their energy that has been wasted. 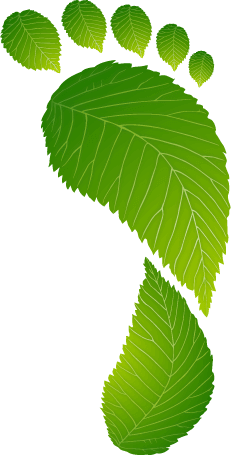 Nowadays, the number of businesses that consciously seek to go green is growing fast. This is important not only from a “corporate social responsibility” aspect but also because it can be a very effective marketing tool in the hands of companies, giving them a competitive edge. The carbon footprint of humankind is 54% of its total ecological footprint. Moreover, this is the fastest growing component. 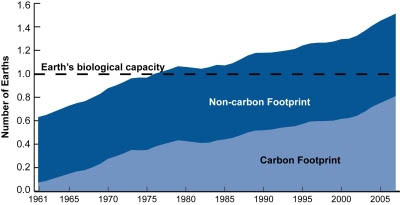 The carbon footprint of mankind has increased 11-fold since 1961. The reduction of this component is the most important step humans can do in order to avoid overshoot and create a livable planet. We need to move on to qualitative civilization from the quantitative one. This is only possible with paradigm shift.